Fitness Odds - 2016's Next Big Craze! Home > News > Entertainment > Fitness Odds – 2016’s Next Big Craze! Fitness Odds – 2016’s Next Big Craze! Until they start creating perfect human beings from a test tube, we will have to continue to perform this thing called “exercise” in order to obtain our individual health goals. Not everyone likes going to a gym or running on a hamster wheel to improve physical fitness. Luckily, the brilliant minds at Humanity Inc. are always coming up with innovative ways to get fit or stay fit; spinning, yoga, HIIT, and crossfit are just a few of the popular fitness routines that have gained traction in recent years. Their advocates swear by them, but trust me when I say, there is more out there. You don’t trust me? Fine, I’ll spell them out for you then. Below are the newest and niftiest fitness programs that have been gaining in popularity, and the odds that they will attract the most disciples in 2016. For those of you who spend a lot of time at the gym, you’ve probably already seen these futuristic looking cardio machines. No, they won’t blast you off to another galaxy while you watch sports highlights. “Alternative motion machine” is the name that is catching on, and although they have being showing up in gyms for a while now, the last year has seen them migrate to the home. Expect that trend to continue going forward. Obstacle courses have been increasing in popularity over the last few years. Many people have been participating in course races or mud runs like the Spartan Race, Tough Mudder, and Warrior Dash. That trend is sweeping through North America and is not going away anytime soon. The very popular Tough Mudder saw 20,000 participants in its debut year (2010). Since that time, participation has sharply increased to over 2 million people. As more and more people take part in these gruelling obstacle races, you’re seeing a trend in year-round training as well. Martial arts aren’t anything new, but there has been one discipline that has seen a big surge in participation and that’s jiu-jitsu. In case you’re not familiar with the art of choking someone out, “jits” as the pros like to call it, is a martial art that involves grappling and submissions. You’ve probably seen it used in mixed martial arts when fights go to ground. Considered one of the best self-defense courses one could take, BJJ (Brazilian jiu-jitsu) is also one of the best full-body workouts out there. Whether you throw on a gi or a rash guard and board shorts, going for a jits roll will leave you a sweaty mess. It doesn’t matter how fit you are, BJJ will work a whole other level of cardio. Not only are you getting into great shape, but you’re learning valuable ways to choke your friends out (y’know, should the need arise). Bouldering is rock climbing … but without the ropes and harnesses. It’s just climbing shoes, a bag of chalk and some safety mats. Sound dangerous? Don’t worry, you won’t be a hundred feet off the ground. 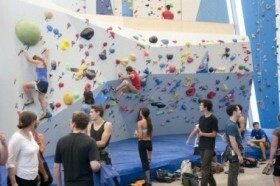 You’ll be about ten feet from terra firma, maximum, as you challenge short but tricky bouldering walls. The joy is found in completing a climb and knowing you worked the majority of your muscle groups. The sport is getting more and more popular, and the short walls mean bouldering isn’t confined to traditional warehouse-like climbing gyms. More and more athletes are starting to swear by movement training like Primal Movement. Not sure what it is? It recently garnered a ton of attention when UFC Champion Conor McGregor started showing fantastic results and introduced his movement coach Ido Portal. Primal Movement is basically a set of stretching and movements that prioritize basic, natural movement. It helps our bodies gain flexibility, repair and prevent injury, and build strength and skill. It might look ridiculous but nothing can be as bad as Zumba. Many high-level athletes are moving toward this type of training instead of muscle building. Expect to see more and more people adopt this as it’s something that can be done in your home or at the park. Just expect some weird looks. Peripheral Heart Action is nothing new to the fitness world, but it’s definitely making a comeback. The system was created in the 1940s and made famous in the 1960s when Mr. America/Mr. Universe title-holder Bob Gajda saw great results with PHA training. In a nutshell PHA is kind of like circuit training but without the pain. It’s an effective method to make exercising far more tolerable. You rock a bunch of stations where the exercises that are chosen will allow you to pump blood to the extreme ends of the body. This prevents blood from localizing and keeps “the burn” at bay. Although you’re doing something similar to circuit training, you’re doing exercises that act like a diversion from the pain and stress that comes with regular workouts. PHA training has been a great way to get kids involved in working out, and more and more adults are starting to rediscover this alternative way to get in shape without the stress or injuries that sometimes come with traditional circuit training. Not everyone likes showing up to a gym to feel like a hamster on a wheel. How about getting a full body workout and learning the art of acrobatics, trampoline, jump rope, silks, tightrope, trapeze, aerial hoop, and juggling? You know, all the best parts of a circus.